Face to face with fighters of the Islamic State group at the site of a US drone strike in Yemen. Kate Adie introduces this and other stories from around the world. 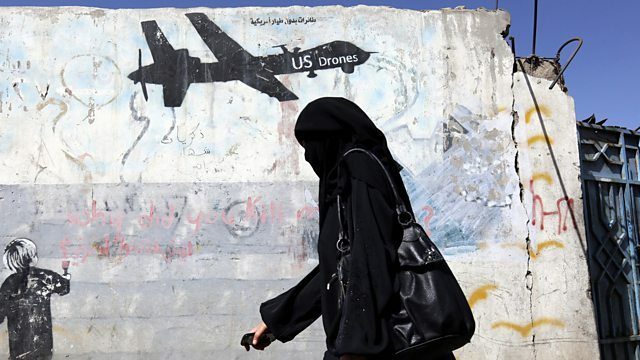 At the site of a US drone strike in Yemen, Safa Al Ahmad hears the sound of danger – the jihadi songs of ISIS fighters who want to know why she’s there. She reports from the no man’s land between Houthi rebels, the Yemeni army, armed tribes, Al Qaeda and ISIS, and she reflects on just how complicated the conflict has become. In Nigeria, Mayeni Jones enters the wired world of political “Godfathers”. Their faces stare out of election posters, their rallies attract hundreds of adoring fans and yet they aren’t standing for election themselves. In Russia, Chloe Arnold remembers her first visit to the avant-garde Mayakovsky Museum in Moscow and asks if it will ever be allowed to re-open. In Turkey, a yapping dog and a sleepless night lead Mark Lowen to question whether it’s ever acceptable for foreigners to tell locals how to behave. And in South Africa, Gavin Fischer finds out that while Fafi may be an illegal, Mafia-controlled lottery many players believe there is a mystical path to winning big.